Red Hen Press, 9781597092746, 80pp. 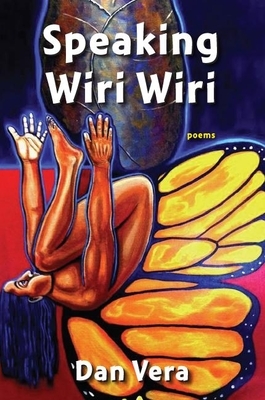 Winner of the inaugural Letras Latinas/Red Hen Poetry Prize, Dan Vera’s Speaking Wiri Wiri is a work of historical insight and wry wit, unexpectedly delightful and full of surprises as it meditates on the challenges of multiple identities, ethnicity, geographies of migration, familial displacement, popular history, and more. Everything is fair game for Vera, who finds poetry in the mundane and the monumental, the hidden lives of iconic television stars and the alternate and accidental histories of Latinos in the United States. Carmen Miranda makes an appearance, as do Captain Kirk, Vladamir Nabokov, and José Martí in a literary landscape careening lyrically between lost and found. Dan Vera is a writer, editor and literary historian living in Washington, DC. He is the author of the poetry collection The Space Between Our Danger and Delight (Beothuk Books, 2008), and the editor of the gay culture journal White Crane. His poetry has appeared in various journals including Notre Dame Review, Beltway Poetry, Delaware Poetry Review, Cutthroat, Gargoyle, Little Patuxent Review, Naugatuck River, the anthologies Divining Divas, Full Moon On K Street: Poems About Washington, DC, and DC Poets Against the War. He s the co-creator of the literary history site, DC Writers Homes, and on the board of Split This Rock Poetry."